Q From James Agenbroad: I was of the impression that cracker jack was originally used to describe a squared-away US sailor, related to the early meaning of the term crack which you described in a recent article, and with jack tar for a sailor. Then it was appropriated for a brand of caramel corn. Is this right? A Crackerjack, spelled like that, is now widely known everywhere English is spoken as a way to identify something as excellent. (Here in Britain it’s inextricably linked to a BBC children’s TV programme of that name, which ran from 1955 to 1984.) In origin, though, it’s as American as you are, Mr Agenbroad. Let’s start with the caramel corn. North American readers will know of this long-established proprietary snack of sugary peanuts and popcorn, for which advertisements first appeared in newspapers in 1896. An often-retold story about its naming has an early customer saying “it’s crackerjack” on tasting it. That must be apocryphal, though it’s certainly possible that an early user might could described it that way. Among horsemen generally, the opinion was that Proctor Knott would, in time, be put in first-class condition and that it will take a “cracker jack” to beat him next year. New York World, 3 Sep. 1889. It quickly became fashionable and was applied to champions in the new sport of cycling, to excellent baseball players, successful gamblers and generally to anything or anyone superb or superior in quality. It was a savvy choice of name for the snack. An early advert for Cracker Jack. You’re right to link the first part of the term with the much older user of crack as a term of approval, a usage I discussed recently in connection with crack shot. Jack here was probably added to rhyme with crack to make the epithet more bouncy, although it could be — as you suggest — the generic term for a man (as in jack tar and jack of all trades), which would make crackerjack a person with excellent qualities. US Navy sailors have been called crackerjacks, though that’s a transferred term from the nickname for their blue uniforms, which are formally called enlisted service dress blues. 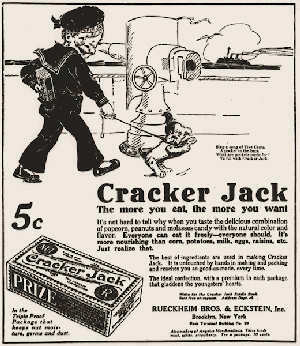 Its source is advertisements for the Cracker Jack snack, which from 1916 began to feature a uniformed Sailor Jack (and his dog Bingo) and the term was taken up by US Navy sailors themselves. In short, the usage has changed greatly over time: crackerjack first denoted excellence, then it became a trade name, then it was transferred to a particular US naval uniform and then sometimes to the sailors who wore it. Last modified: 23 November 2013.